Make a tangible impact on the families we serve. Today, more and more of our partners are asking Compass Family Services about how they and their children can get involved in our efforts to end family homelessness, too. We absolutely want to harness the energy and enthusiasm of the members of our community, since we cannot do this work alone. In response, we have created the Compass Family Services Kids’ Volunteer Toolkit, which provides digestible information about family homelessness and Compass’ programs and services, and features a variety of meaningful ideas and planning tools to help guide the younger members of our community in their first forays into the realm of community service. We aim to offer creative ways for kids to take the initiative to raise funds or organize a drive, and connect these activities to the direct impact they will have on the neediest members of our community. Kids can peruse the Toolkit and adopt one of our ideas on their own, or loop in their family, their class, or their scouting troop. And our Toolkit is meant to provide guidance and inspiration – we have not captured every idea, and we would love to hear about other ways the young people in our community are getting engaged and involved in community service, particularly if these efforts impact family homelessness in our community. Thank you for wanting to get involved, and for helping us end family homelessness! The Brandeis School of San Francisco presents Compass Family Services with a donation and a presentation on family homelessness and Compass' work. Help us raise money for the homeless and at-risk families that don’t have a warm bed to sleep in at night, sufficient food and water and basic household necessities. Make it a group activity with your friends, family, classmates or colleagues. Pick a fundraiser that works for you. Remember to consider how many people are involved and their ages, when and where you want to hold the fundraiser, how much time and resources you have and what group of people you are targeting for donations. Help our families meet basic needs by hosting a drive to collect supplies. Our most needed items are travel-sized toiletries, new socks and underwear and grocery store gift cards. For inquiries on in-kind donations, please complete the form below. Samantha Grier from Caring for Children takes a group photo after collecting teddy bears for Compass children. BlackRock employees helping our students at Compass Children's Center learn gardening. Help families immediately by fulfilling a program or classroom wish list. All items on our wish lists are items that a family needs or an item that will be used to help continue services for families. Help serve Sunday dinner at Compass Family Shelter. Each Sunday, Sherith Israel Synagogue cooks and delivers a Sunday meal for our families and we would love your help! Maximum of 4 volunteers per dinner. To sign up, contact klamb@compass-sf.org. 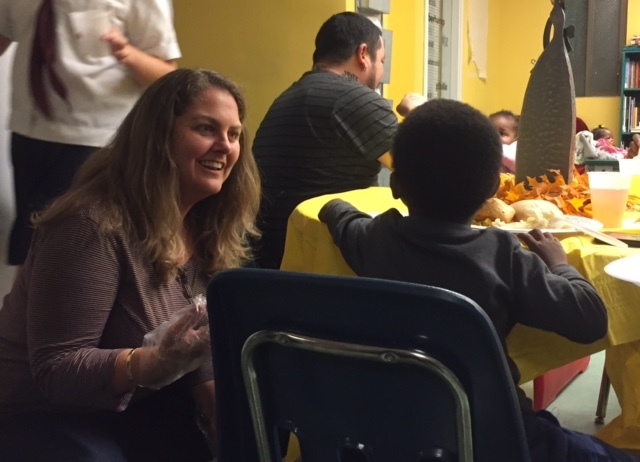 Compass Family Shelter volunteer serving Thanksgiving dinner. Volunteers helping parents and children pick out costumes at our annual Halloween Costume Giveaway hosted by Microsoft. We could use all the help we can get to scan paper, keep our database updated and our offices organized. For more information on our ongoing volunteer opportunities, please complete the individual volunteer form. For more information on our group volunteer events throughout the year, please click here.